The intermittent thumping of the clock during a blitz game is recognizable to any competitive chess player. Blitz is the blood and guts of chess… nothing artificial, no gimmicks… just hard and fast. Some of us are better at blitz than others… and some are really good… amazingly good. GM Bobby Fischer is one of these. 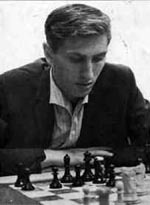 In September, Larry Parr wrote an interesting article about Bobby Fischer's skill at blitz chess. Many of us have heard that he was nearly unbeatable and England's GM Nigel Short still makes this claim. The article details many stories about Fischer's participation in strong blitz tournaments such as the Herceg Novi (Yugoslavia) tournament where he scored a blistering 19 - 3 (+17 -1 =4). How good was his performance? "It had four world champions competing, and Bobby not only finished 4 ½ points ahead of Tal in second place, he also obliterated the Soviet contingent, 8½ - 1½, whitewashing Tal, Tigran Petrosian and Vasily Smyslov, six-zip; breaking even with Viktor Korchnoi; and defeating David Bronstein with a win and draw. According to one report, Fischer spent no more than 2 ½ minutes on any game, thereby also giving, in effect, heavy speed odds to powerful opponents." Given Fischer's legend and GM Short's recent "Fischer sightings" at the Internet Chess Club (ICC), these developments provide us with considerable intrigue as to whether Fischer still has his form. If he can beat Short by placing all of his pawns on the third rank in consecutive moves, or with 1… f6, 2… Kf7, 3… Ke6, then perhaps it would be good to see him in a blitz set with GM Viswanathan Anand. It hard to believe, as Fischer suggests, that he only plays "Fischer Random." Short is not the only one having confessed to losing several blitz games in a row a mysterious GM on the ICC (who plays strange moves). The article also mentions Fischer's performance at the 1971 Manhattan blitz tournament where he scored an amazing 21½-½!! Who drew? Read the article to find out this and more!